Hello brands. I understand that you have many dynamic stories that you would love to engage with millenials, Gen-Y, Gen-Z and other lucrative cohorts. I’m here to help! I love your brands. I am not selling my soul just to collect a fat check to afford this life-ruining 1977 Maserati. 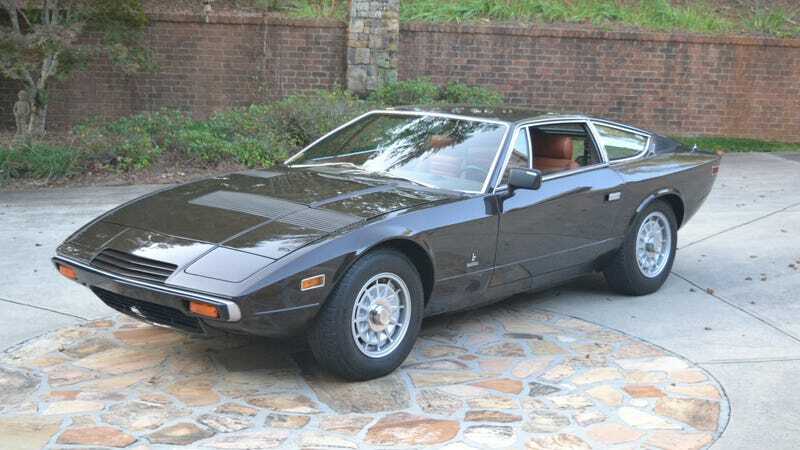 And I’m ready to throw that out the window for this 1977 Maserati Khamsin, currently up for auction at Bring A Trailer. The Maserati Khamsin is a bit of a tricky car. Built with a combination of adventurous French engineering and Italian craftsmanship, it is probably as complicated as a machine can be without having NASA printed on the side. Some of the systems were hydraulic (thanks to Citroën owning Maserati at the time), other systems were a bit more antiquated. The car’s quad-cam V8 engine traces its roots back to either the mid 1950s or the early 1960s, depending on how you count it. The engine is carbureted but dry-sumped, the suspension (six shocks!) is not linked to the hydraulic system but the pop-up headlights are. Given the mix of specialties going on, I do not know how many service guides you would need, or mechanics you would have to keep on call to keep this car running. And there is little better proof of this than this for-sale listing on Bring A Trailer, with a lovely five-speed manual car with delicate Euro-spec lights and bumpers, done in a conversion that, yes, was thoroughly documented. Now, it’s not a terrible idea to do a compression test on an engine of a dubious old car you’re buying. Hell, if I had done it, I might not have ended up dropping a valve halfway between Little Rock and Memphis on a warm night a year ago. Still, this may be a little bit too thoroughly documented, at least for my comfort. I don’t like to stare this kind of reliability in the face when I’m buying a car. Lie to me a little. But hey, reliability is a myth, and I want this car. And for that, I need that cold hard brand cash. The story of your brand is a dynamic one. I’m here to help tell it in a way that embraces analytics, ROI, CTR and optimization strategies—pivoting when necessary, of course. If you need me, I’ll be selling out, going to work at a PR firm, collecting enough money to afford at least the purchase price if not the first service for this car, then blowing it all on this Khamsin. I regret nothing.